My posture at my desk is terrible, I hunch forward to read internet stories on the computer monitor–my eyeballs may be fritzing out on me too, making me lean in further–but every once in a while I read a story that makes me sit back, smile, and say to myself, “Nice. Now THAT’S the way the world is supposed to work.” I have to thank #SFBatkid for making me lean back and grin…and all the folks at Make-a-Wish and the city of San Francisco, too. Tomorrow, November 15, five-year-0ld Miles, a kid with a wish who also happens to have leukemia, will get his wish in a bigger way than anybody imagined. 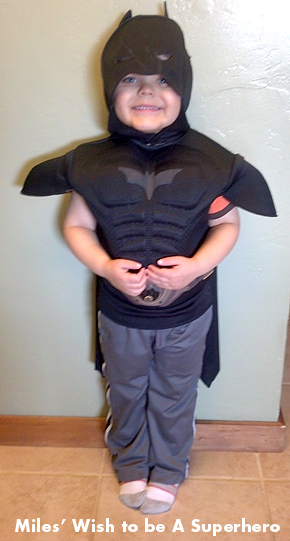 Miles has long wanted to be a superhero…Batkid…and tomorrow he is. The Make-a-Wish folks undertook a really great choreographed flashmob-type excursion to wow Miles…and it struck a chord in such a huge way that the Riddler and the Penguin have no idea what is in store for them. The very full day has a breaking news story about the city’s desperate need for Batkid to come to the rescue…Miles rescuing a damsel in distress from where she is tied to cable car tracks…defeating the Penguin’s evil scheme to kidnap the city’s mascot…stopping the Riddler from robbing a downtown vault…and eventually getting to City Hall where the mayor of San Francisco will present him with the key to the city for restoring order. Along the way, crowds of volunteers will cheer him on, cry for help, etc…and here’s the kicker…more than 10,000 people are expected to be there, volunteering to help the day be more special than anyone could imagine. Ten Thousand!!! (undoubtedly more since the story has gotten so huge). Volunteers are even flying in from other states to be there for Miles. Social media sites are in on the event—for one day only, Foursquare is allowing people in San Francisco to check in from “Gotham City” and “The Penguin” has started daring Batkid to try and get him from his Twitter account. It will be a national news story tomorrow–so in addition to leaning back and smiling, I need to make sure there’s a full box of Kleenex nearby. Keep an eye on Batkid’s feats of derring-do tomorrow–and go give some support to Make-a-Wish, the work they do rocks the world.